Good ideas are hard to stop from happening. After dorking around with Pivot Viewer, I was thinking of things I could “pivot”, and the iTunes App Store was one of them. No real API though, there are some out there that have created APIs, or you could scrape the web, etc but nothing solid. Looks like someone took that idea and ran with it, called ZoomAppy (http://zoomappy.com/). RIght now it looks like it is just the app store, but they have more in store. I agree that Pivot Viewer is “Business Intelligence”, but it is a different way of thinking. Where in traditional BI, you think of looking at metric/measures like sales/inventory, etc. With PivotViewer, you are looking at “objects” and filtering them based on properties. Teams, Bikes, Apps, Cars, People. Also PivotViewer doesn’t give you any type of aggregations besides counts, so it is limited in that regard. What else would be a good candidate for Pivot Viewer? But what I am doing is going back to the iPhone roots, back to 2007. Web apps. 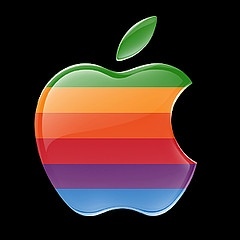 Steve Jobs himself says it is their “other”, open, unrestricted platform they support, so let’s see what it can offer. Reeder/Google Reader? google’s mobile formatted reader site works. IM? meebo has a pretty good web app. Just like regular hipsters, that drink PBR, and lose the flavor and other added benefits of drinking a less “hip” beer, you have to give some things up.. such as..
Background/Streaming music (Pandora/Last.fm, etc) – I did find dance.fm has a HTML5 version or something that streams directly from a web page, so I could almost say others might follow suit. I also have iPod on the device so not to worried, I don’t listen to a helluva lot of music anyways. What else? Not sure yet, we will see how long I last. One thing I can say, there are some games that are web apps that are pretty cool, but don’t come close to the native games … yet. I am writing this from my iPad. What do I think of it? Pretty awesome. More apps will make it even better. Playing “board” games is pretty fun. Crosswords, Sudoku, Words with Friends and others. IMDB and Wikipanion are nice too. News and magazine apps make total sense. Of course this device is just completely built for consuming media but you can still create as I am now. I like email in landscape mode, maps is awesome too. Biggest thing i wish i could do? SMS. Other than that i am pretty pleased. Next versions of the iPad will be better (as usual) so I am pretty excited. iTunes DJ – iPhone, Remote App – Party! Not sure when this came about, but I just realized that there is an “iTunes DJ” in iTunes now. It obviously lets you just play a random selection it picks. But what I didn’t know, is allowing anyone on your wifi network to connect with their iPhone and the Remote App. 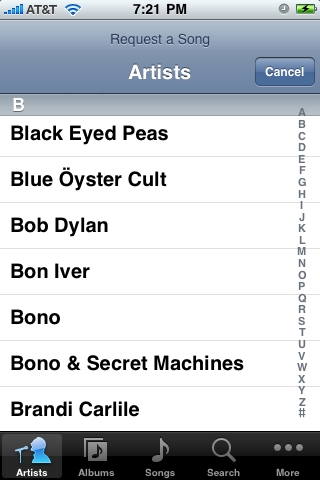 Once you connect with the Remote app, you can browse the library, and request a song. Multiple people can request a song, and vote it up. Totally awesome!! I also pump out the output from my MacBook to the MacBook and AppleTV through iTunes so I get total surround sound. So the Apple Remote app, iPhone, iTunes DJ = ultimate geek iPhone party! Who’s game? One Year Ago Today, I bought my MacBook Pro. And guess what? It is still running, on the original config, original boot, no reformatting, no repaving, no major surgery, nothing. And it still runs great. I have a ton of apps installed, but just enough, just what I need. What is funny though, is that using VMWare Fusion, I have reformatted or redone my Windows VM’s multiple times because of issues. Is that just how things are? I think so. I have to say, the MacBook Pro is an awesome machine. Every time I use it, I wish I could just run a Windows VM for work on it, off a USB drive, just take it back and forth, and that is one less physical machine I would have to worry about.. someday..
What is the longest you have went without reformatting, voluntary or involuntary? Apple Time Capsule Rocks – Microsoft needs to make one. Anyways, since Ella was born, I have TONS of pics and videos of her, on my laptop. And it auto backs up to my Apple Time Capsule. Well, iMovie auto imports videos from iPhoto, and then removes them? I am not sure, but long story short, I was missing some videos from when we got home from the hospital. So what do I do? Freak out? No.. just fire up the Time Machine on my Mac, go back to February, and there is my iPhoto Library, I restore it, and get the videos back. Now, I just need to offload it offsite someone, there is MacMini Colo – Transport – http://www.macminicolo.net/transport/ which looks promising, just a little too much $$, but maybe my next step. But really, Windows needs this. We have a few Windows machines here at home, and I just feel like, umm, stuff is volatile. Thank god for flickr..that is all I have to say. I know there is Windows Home Server, but that is another BOX and updates, and whatever. I just want a device, a dumb device. I know I can get NAS and whatever, but I just want simple. Where is the Microsoft Time Capsule? Now that Google has released its browser, Chrome, that leaves us 4-5 big players in the browser wars. Pretty much everyone has used IE, unless you are a main frame unix guy or something, you at least have probably used it to get Windows Updates. I think I started using it around IE3, then IE4, IE5, IE5.5, IE6, now IE7, and actually I am using IE8 Beta2 at work. IE works, but it has been plagued by security vulnerabilities, and stagnated from lack of innovation from the IE4 days till now, where they are finally picking up steam again. Although, you are kind of stuck to Windows if you want to use IE, one of the major factors I don’t use it as my main browser. IE has somewhere between 70% and 80% of the market share, so your site better work in IE. I do say death to IE6 though. MSFT should push IE7 as a mandatory update. Firefox is multi-platform, a good thing. It also seems to have major releases more often, better auto update support, and of course, extensions, which really extend the browser to something way better than ever imagined. Firefox has security issues sometimes, but they are usually quick to fix, and they are also pushing the competition with every new release. Safari, oh Safari. I did try to use this as my main browser when I picked up my MacBook Pro, but after about 2 weeks I had to switch to Firefox. It just lacks some key features that make me want to switch back to Firefox, little quirks. It does render fast and nice, and yeah, the iPhone version is much better than PocketIE – its not even a comparison. Safari works now on Windows and Mac, which is also a good thing, cross platform is always nice. Opera – well, it has 1% or less of the market share, but it just won’t die. I only use it when I need to test a site that has to work on everything, other than that, not much. Seems that stuff renders different in Opera. They have made some strides in features, like mouse gesturing, and other things that other browsers have “stolen” if you will, but I just don’t see Opera being a big contender in the space. It is cross platform which is nice, but it just doesn’t have the steam the other browsers do. And then the new player, Chrome. Some are saying it already has 1, 2 maybe eve 3% of the market share. I installed it and used it for about a week as my main browser. It uses WebKit, the same rendering engine as Safari, so sites that work in Safari for the most part work in Chrome. (Firefox uses Gecko by the way). Chrome is the fastest out of the bunch, at least from my experience. The new concept of tabs on top is different. The process model is different, where each tab is a process (IE8 Beta2 has this as well), and there are other “new” features in Chrome – most of which are in IE8, FF 3.1, or available as extensions on FF 3.1. It isn’t cross platform yet, but they say it will be in time, fair enough. So from the list above, you have Firefox and Opera (which is not used by many) being cross platform. Which means, if you want to use Windows flavors 2000, XP, Vista, or Mac 10.4, or 10.5, or many flavors of Linux, Firefox is pretty much the way to go, to get the consistent experience from OS to OS. Most companies and corporations are STUCK on Internet Explorer 6. This just makes me cringe. At least get to IE7, it has been out for two years, IE8 is coming out next month!! I see chrome gaining market share, but Google is walking a fine line on privacy it seems, they have already backpeddled a few of their policies since they released Chrome. I would recommend every once in a while switching to a new browser for a week or two, just to keep up with the changes. I guess you should switch not just browsers, but everything if you can (OS, Media Players, etc, etc) – Try It!